Tourists visiting Sikkim will now be able to hire motorcycles as the transport department today introduced the rental service for the first time in the state. For those who cannot ride a bike or do not have a licence, drivers can also be hired. Today, transport secretary S.B.S Bhaduria launched the service with five 500cc Royal Enfield bikes belonging to BB Line Tours and Travels. "It is an innovative scheme to motivate tour operators and encourage traffic-free riding. 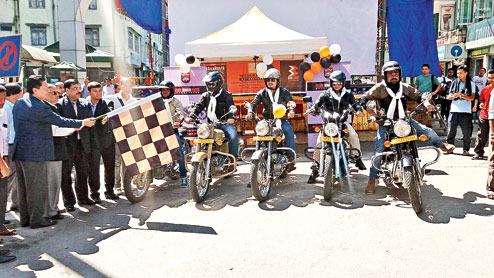 We hope many people would apply for yellow registration plates (for two-wheelers)," Bhaduria said. Yellow number plates are meant for commercial vehicles, like taxis and trucks. Bhaduria said such rental services were available in Goa and Himachal Pradesh. Manager of BB Line Tours and Travels, Gelek Gyatso, said: "There are many budget tourists who travel solo or as a couple and they cannot afford to hire a vehicle. Hiring two-wheelers will not only give them freedom but will also reduce cost by almost 60 per cent. For example, one has to pay around Rs 18,000 for a North Sikkim tour (two days and three nights on SUVs). In a two-wheeler, it would cost less than half." Sources said more tour operators are likely to apply for the permit soon.